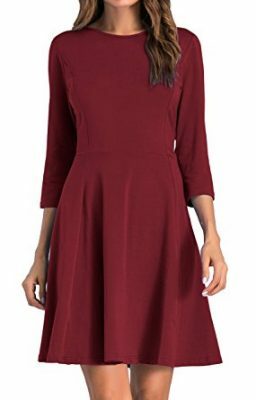 Sarin Mathews Fit & Flare Dress- This dress has fantastic reviews, rings up for less than $25 and comes in four bright winter colors, perfect for the holidays. 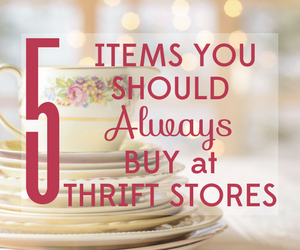 I love the 3/4 length sleeves as it allows for great layering options with coats, sweaters or even vests. 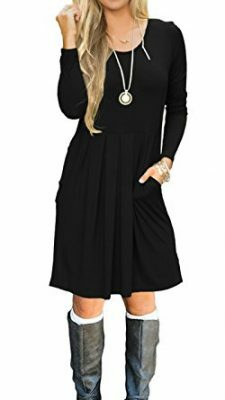 Auselily Swing Dress with Pockets–Slightly more casual, this soft and comfortable dress would be perfect paired with leggings and boots and layered up with a chunky sweater. 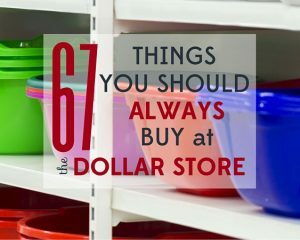 It comes in eleven different colors and who doesn’t love some pockets with your dress of choice? 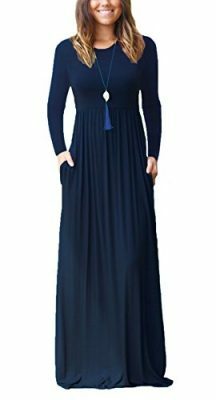 Dearcase Long Sleeve Maxi Dress-Even casual fabric gains some drama when it’s cut to the floor! This dress is fitted in all the right places, comes in beautiful jewel tones, has great reviews and will cost you only $21.99 at this moment. I’m picturing this with a plaid blanket scarf to balance out the length! 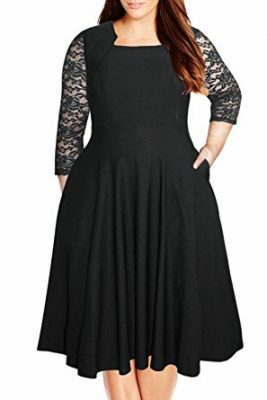 Nemidor Vintage Cocktail Dress–Here is a plus-sized option that I think is totally gorgeous. It’s a little pricier than our other dresses at $34.99 but it’s a true party style that would work for many more formal events. 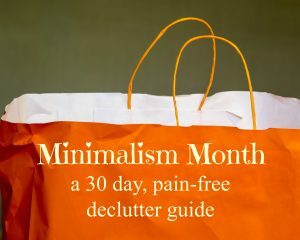 It’s available in black, navy and hunter green. 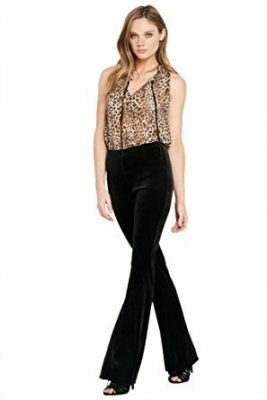 Poshsquare Women’s Velvet Bell Bottom- Now many of us would say that Bell Bottoms never really went out of style, but regardless of your opinion, they are flattering and totally back in right now! These high-waisted velvet flared palazzo pants will give your outfit a little extra something for only a bit over $20! Reviews say they are comfortable and fit great! 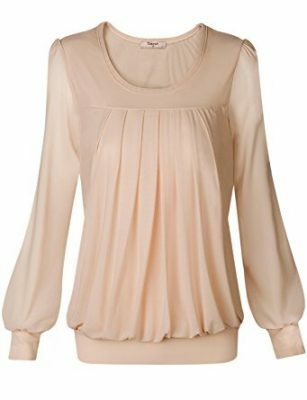 Timeson Women’s Pleated Front Fitted Blouse-I think this blouse would be perfect paired with the Velvet Bell Bottoms. The ladylike pleats give it a formal, clean look and the sheer sleeves make it so pretty! Available in a whole sleigh-full of colors ranging in price from $16.99-$21.99. 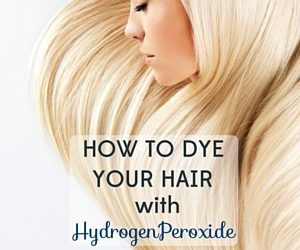 (I personally love the blush color!) Click here to buy this blouse now! StyleDome Elegant Flared Bell Top- Now this might be a tad out of your comfort zone but I just want you to give it a chance! 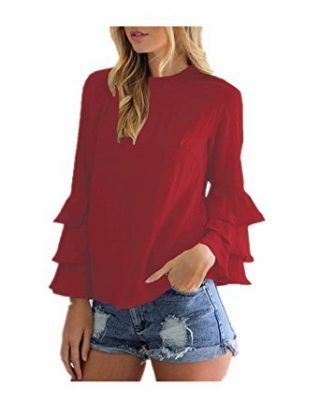 The StyleDome Elegant Flared Bell Top is a real statement style with the dramatic sleeves and I think it looks especially good in eye-catching red. Some of these styles are sold out, but you can also check out this bare shoulder version if you don’t mind showing a little skin in December! 82 Days Ponte Midi Skirt–When you’re styling a dramatic top, what you want is a sleek, more understated foundation and this skirt fits the bill perfectly! Available in tons of colors and in plus-sized styles as well this stretchy midi skirt has great reviews and some are less than $20. Vintage Statement Bib Necklace–This necklace is stunning and at only $14.99 you can’t go wrong! One of the things I’ve learned is that a dressier style necklace really looks great with casual clothing. 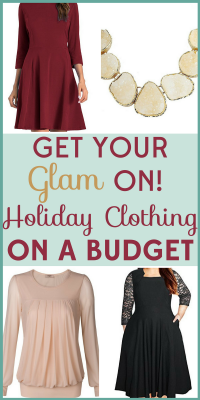 The mix of styles is fun and it gives your outfit a little extra “something”. I’ve even gotten comfortable with wearing my bling-y necklaces with a simple t-shirt or sweatshirt. 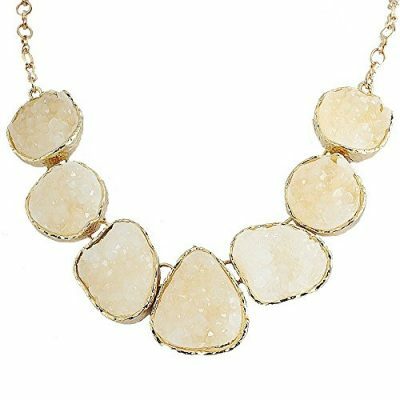 Drusy Sparkley Choker–I love Drusy (whatever Drusy is) and this necklace drips in drusy for only $11.98! I think the white is especially beautiful and this would work with lots of different necklines.